Cut the pieces of the chair to size, referring to the anatomy illustration (page 24) and cutting patterns (page 25). For the back slats, start by tapering them so the middle one is 4% inches wide at the bottom and 5% inches at the top; the outside slats should be 2'A inches at the bottom and inches at the top. You can make the cuts on a table saw using a commercial jig or the shop-built version shown opposite. Next, set the slats edge to edge on a work surface; the ends will be uneven. 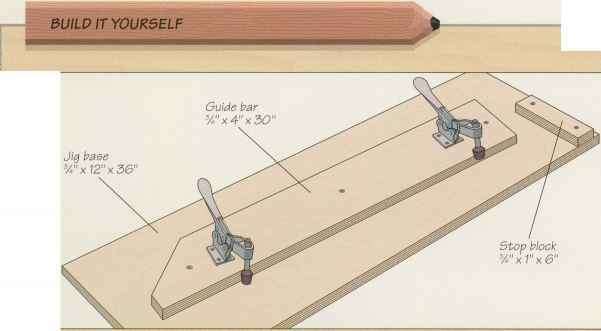 To even out the bottom edge, use a pencil and a carpenter's square to mark a line across the outside slats that aligns with the end of the middle piece (above, left). 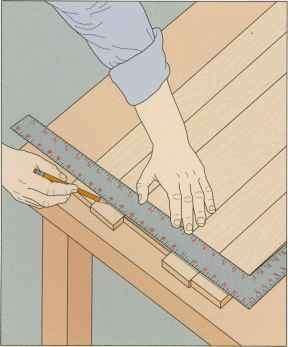 Trim the outside slats along the marks, then draw a line down the center of the middle slat. 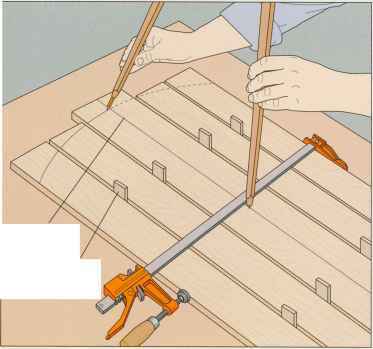 Reposition the slats and clamp them together with their bottom ends aligned and '/«-inch-thick spacers between the pieces. Adjust a compass to a 16-inch radius, set the point on the middle slat centerline 18% inches from the bottom end, and draw the curve at the top end of in lats (above, right). 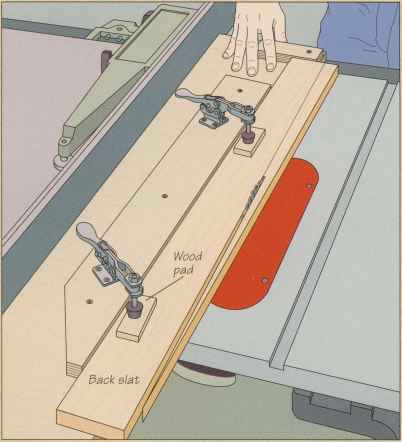 Cut the slats on your band saw, then round ovr their edges (photo, above).